There are a lot of recipes for cassoulet here in the southwest of France. Castelnaudary, Carcassonne or Toulouse fight for the crown of the best recipe or the most original one. Cassoulet is a hearty dish and meant for winter, but restaurants here serve it to tourists in the summer when a lighter diet may be called for. The origin of the dish goes far beyond the introduction of freezers and other electric appliances, and even before that tomatoes became known in France in the 16th century. This means that most meats are salted or confit — preserved in fat. In the mounjetado or “estouffad de mounges” (slowly cooked beans) here in the Ariège people use “coustellous” (salted spare ribs), dried liver sausage and another sausage made from pig’s rind – the couenne. In my version, I used spare ribs (less salty), dropped the liver sausage and added confit de canard – because I had made that previously – and fresh sausage. No tomatoes here, but onions and carrots. The white beans had been prepared in season and stored away. This dish does not call for an entrée or dessert. This recipe takes time and needs to be prepared in large quantities. I gave left-overs to neighbours in the village and put some of it away in the freezer, since we have those now. Rinse the beans, put them in water to soak for two days, changing the water every 12 hours or more often. Put them in a lot of boiling water and cook for 15-30 minutes. Cut up the vegetables, garlic and the meats apart from the duck leg and fresh sausage. Put some duck fat in a large casserole and heat on an average fire. Add the cut-up vegetables, the garlic, and the meats and stir for a while. Add the beans and cover with water or stock. Bring it to the boil and then turn the heat down and cook for at least three hours. 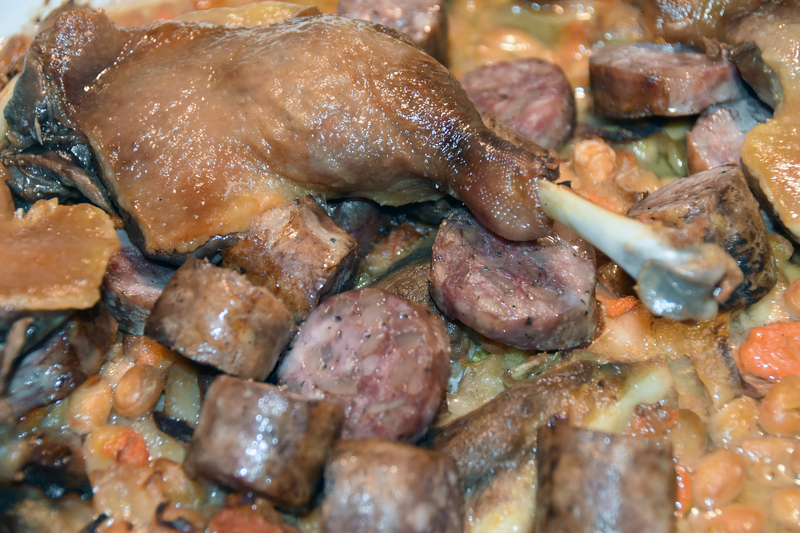 Towards the end, bake or grill the fresh sausage and warm up the confit duck leg. Put the meat on top of the casserole and put in a hot oven without a lid. Or put everything in a large earthenware container (as the word cassoulet comes from cooked in a “cassole” earthenware dish) and put that in the oven. Cook for 30 minutes. Let it cool. Stir and break the “skin” formed on top, repeat this at least two times during the time (can be 24 hours or more) before serving. Serve by ladling beans and vegetables with pieces of meat in deep dishes. You can serve brown rustic bread with it to soak up the tasty fat from the dishes.